Oakland Church Steps Out On Faith And Pledges To Stop Calling Police In California, members of First Congregational Church of Oakland says it's a reaction to white people using law enforcement as a first resort when interacting with people of color. 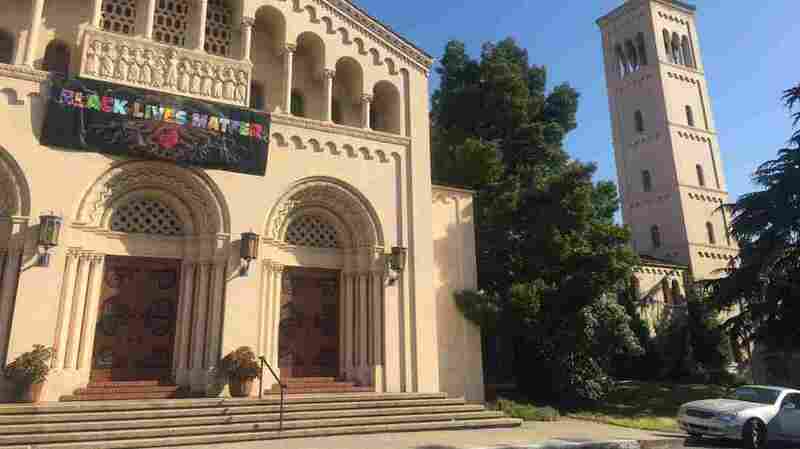 When the First Congregational Church of Oakland decided to hang a Black Lives Matter sign, they started a conversation that led them to try to stop calling police, especially on people of color. The church — which calls itself First Congo, for short — announced its decision around the same time as a wave of news stories broke about white people calling police on people of color. That included a now infamous incident at Oakland's Lake Merritt, where a white woman called the cops on two black men who were barbecuing. One of the men who was cooking out that day, Kenzie Smith, describes the moment when he realized police had been called on him as terrifying. "In my mind I thought I was going to die," he said. "This is how it ends," he said to himself, while he watched the woman on the phone with 911 dispatch for hours. Smith said as a large black man, having police called on him felt no different than putting a target on his back. First Congo has no formal pastor, instead they invite congregants to take turns at the pulpit. Their dialogue about turning away from dependence on law enforcement began several years ago, long before there were national headlines about police being called on a grad student for napping, or on Native American teens for attending a college tour, when white people got nervous, or felt they didn't belong. Church members were talking about putting up Black Lives Matter signs following the shooting of Michael Brown in Ferguson, Mo., and other similar cases. The church wanted to show solidarity with the movement. But Vanessa Riles spoke up, asking fellow congregants to consider what displaying that sign actually signified. "As an intentionally intercultural congregation, and an intentionally interracial congregation," she said, "we can't just put up a sign like that, and not have it mean something." Church members began to talk about what it really meant for black lives to matter. For Torbett that meant also trying to understand how white people, like herself, can confuse safety with comfort. "There are times we are called on to be uncomfortable, in the service of being in conversation with our neighbors, and that doesn't mean we're not safe," she said. A giant Black Lives Matter sign now hangs on the front of the church. Inside, in the chapel, lit by stained glass, stands a shrine to victims of police killings. Some you may have heard of, such as Tamir Rice, a 12-year-old shot by police in Cleveland, in 2014. Or Oscar Grant, shot in 2009 by a BART police officer while restrained and lying on his stomach. The officer later claimed to have mistaken his gun for his taser. Other faces and stories are less familiar, such as Demouria Hogg. Hogg was asleep in his car, when Oakland police officers tried to wake him. He was shot after an officer said she saw him reach towards a gun in the front seat. The city of Oakland paid $1.2 million in compensation to his family, but admitted no wrongdoing in his death. Riles said that Black Lives Matter is, in large part, about confronting the deaths of black and brown people like these at the hands of police. So if the church was going to hang the signs, Riles asked, what else were they going to do? "Because as a black person, if I see a church with a sign that says Black Lives Matter, the first question in my mind and in my heart, is what does that really mean?" she asked. "Are they just putting up a sign because it looks good, and it makes them look good as a congregation?" "How can we say black lives matter, and be a church that calls the police on people, especially black people, poor disenfranchised black men," she said. She told fellow church members that "if anything we need to be working towards not calling the police." Riles was raised in a once almost entirely black Oakland neighborhood where police were not welcomed as beacons of safety. "I haven't grown up feeling like the police are my heroes and they're going to rescue me," she said. "I've grown up feeling like the police don't come when you call them, or they don't really do anything, or someone calls them on you and your friends when you didn't do anything." So First Congo congregants started to talk about when they had called police, and why. Although they didn't call police often, they realized when they did, it often was on homeless black men. The church is an open space, the doors are unlocked, and there are community services located inside the building. Homeless people come in, and sometimes they are in the throes of a crisis created by mental illness, substance abuse, or some combination of the two. The homeless population in Oakland is disproportionately black. According to a survey from last year, more than 80 percent of Alameda County's homeless — where Oakland is located — were living in homes here, before they were on the streets. Statistically speaking, that means many homeless are living on the streets because of gentrification and the housing crisis. When someone comes into the church in a crisis, volunteers have felt threatened, and some have turned to police, "because they feel like their life is at stake, and they feel at risk, and they don't know what else to do," Riles said. Riles and her fellow congregants also know that in similar situations across the country, police have shot and killed mentally ill and intoxicated people. "Can we really feel like we are doing God's will," Riles asked, "or we are following in the footsteps of our movement founder, Jesus, who literally risked himself over and over and over again for people who were the most vulnerable if we're calling the police for our own safety and security and risking the lives of actually the most vulnerable?" Barry Donelan, the head of the Oakland Police Officers Association, said he respects the church's decision. He admits that some people are too eager to call police as a first resort. "Most police officers face that on a regular basis, where there's some address they find themselves having to go there on a regular basis, for issues that shouldn't be police matters," he says. Donelan admits that can be frustrating. But, he said, his members are always willing to serve when called, and if the church ever needs them, "my members are going to be there to serve you." Suicidal impulse or spiritual practice? The news of the church's decision to divest from police quickly hit conservative media. Fox News' Tucker Carlson featured a segment on the church. "The church in Oakland," Carlson said, "is encouraging its members not to call police, even when they feel they need the police, if that's not a suicidal impulse, I mean what is it?" Church lay leader Torbett said the answer is simple. She called the decision a "spiritual practice," based in Christian theology. "One of the things that gets lost in Christianity in this country often is how Jesus was positioned in the society that he lived in," Torbett said. "He was part of an occupied nation, a colonized people. A brown-skinned man, who was surveilled, targeted, harassed, finally arrested, beaten, and killed by state forces." Torbett said after the Fox news segment aired, the church received a flood of messages on social media. Some called them anti-police — they are not, Torbett said — but she was most surprised by messages deeply concerned for church members' safety, fearful they were putting themselves in harm's way. "This sense that people seem to have that outside our doors are hordes are people who mean to do us harm, and are just waiting for us to reduce our reliance on policing, so they can do that," Torbett said. The assumption that only police can save you, and that the church was just going to stop calling law enforcement and leave their members to fend for themselves is false. "Really what we are talking about is how do we build up a network of community support, of people who can show up for each other," she said. "Isn't that what churches should be doing?" The church knows that a path away from policing cannot happen overnight. For one thing, if something is stolen, they need to file a police report to get any insurance money. And they don't plan to leave church volunteers to fend for themselves in a potentially violent interaction. Instead, what they are hoping to do is create a volunteer force of community and church members trained in conflict resolution who can be on-call, if anything happens. They are reaching out to other churches, places of worship, and community organizations to ask for volunteers. Vanessa Riles said the notion of communities coming together to take care of their own, rather than relying on institutions like police that have a spotty record in their interactions with people of color, is nothing new. It is as old as Oakland's very own Black Panther Party. "Their full name was the Black Panther Party for Self Defense," Riles said. "It was about, how do we defend ourselves, who really is the violent offender, and even if it does come to something within the community, then how do we deal with that, without putting more lives at risk." Torbett said that when people — especially white people — default to calling police when something goes wrong, or when they just feel uncomfortable, it is basically outsourcing crisis management, safety and potential violence to the state. "Which is exactly what the religious leaders said when Jesus was arrested," she explained. "They said, 'We can't kill him, but you can. Our law forbids it — but you can do it.' "
To learn from the lesson of Jesus, Torbett said, the church must strive to take care of their own community, even those just outside their doors. Keeping the church and church members safe, she said, does not have to mean placing others, especially people of color, at risk.